Can you believe it's already been 2 weeks since the last Harry Potter inspired collection from LynBDesigns?! Well, I've got the last of the three to show you all today. This is the What Ailment'll It Be? Collection. 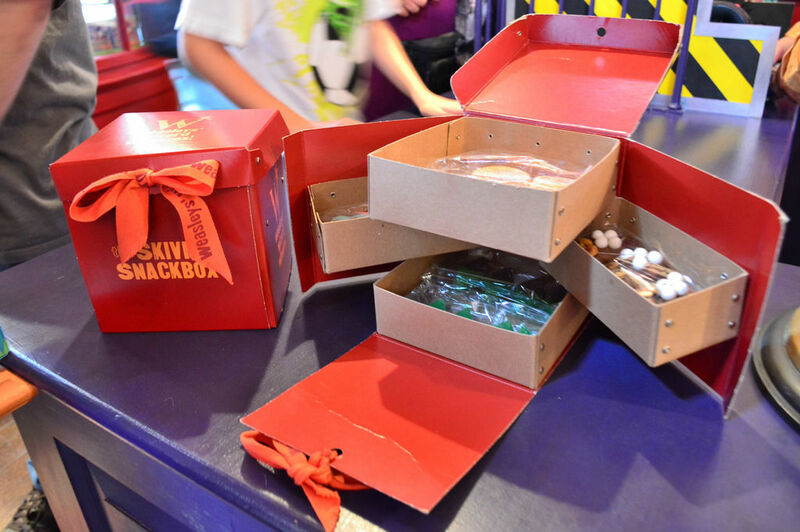 It is inspired by some of the sweets the brilliantly, mischievous Fred and George Weasely made for their Skiving Snackbox. "What's a Skiving Snackbox?!" you ask? For those of you who don't know, we'll get technical here and use the magical world of Harry Potter wikia, it is "a range of sweets to make the user appear to be ill". I mean, where was this when we were in school and tried to fake being sick?! My mom never fell for that. If you didn't have something spewing from somewhere or didn't have itchy red spots all over you, you were going to school. I mean, it didn't help that I was homeschooled for the majority of my school life, but there was no faking being sick. And if you don't know who Fred and George Weasley are...well...then...you're missing out! And that's no one's fault, but your own. 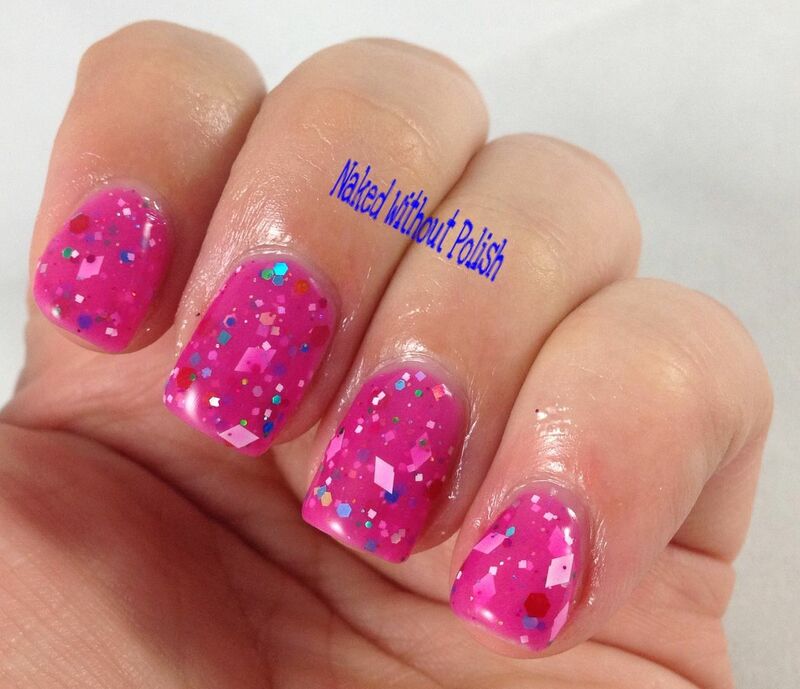 Anyway, back to why you're here...the polish! You ready?! 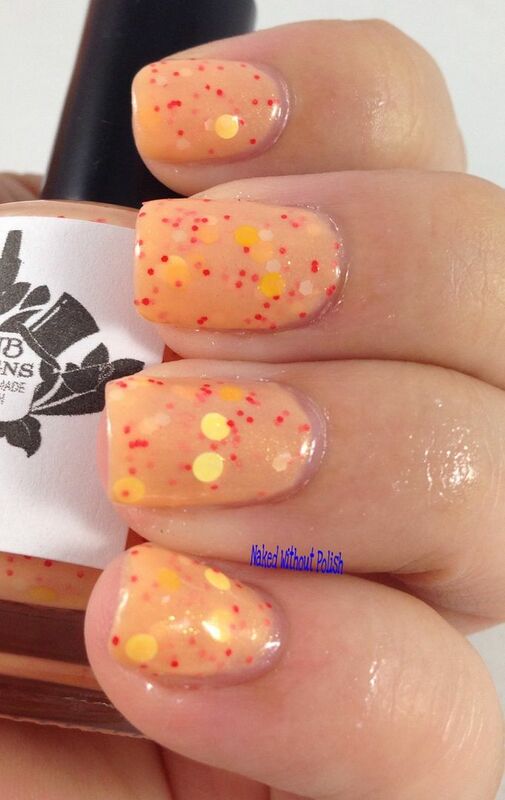 Dizzying Dandy is described as "a sherbet orange crelly base with peach flakes, orange, white, and yellow glitters". 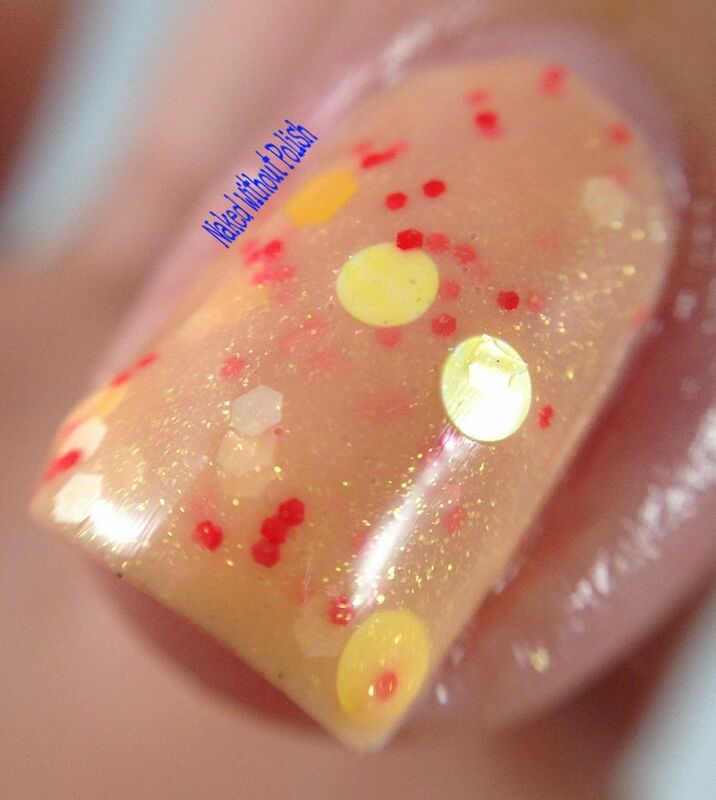 Shown is three coats of Dizzying Dandy. 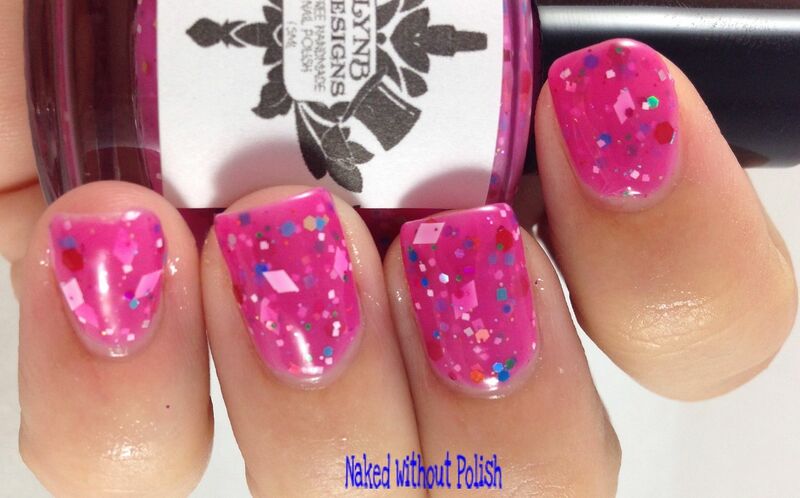 Dizzying Dandy is inspired by Fainting Fancies. 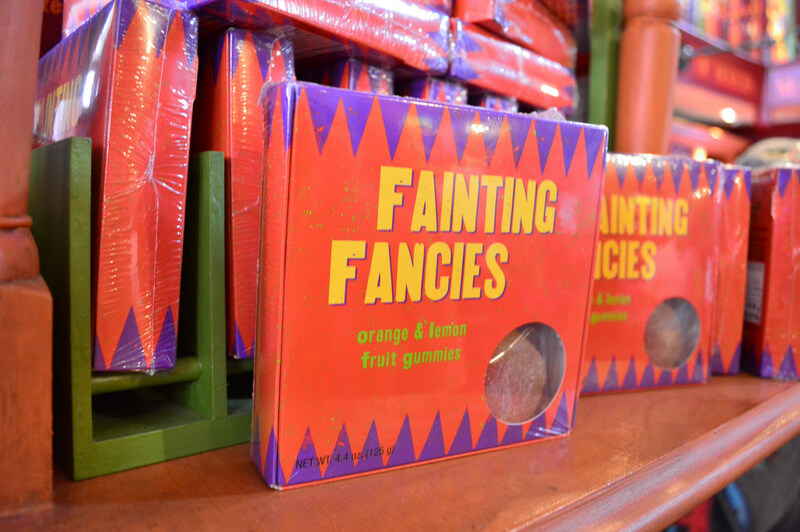 Fainting Fancies are "designed to make the eater faint within seconds". 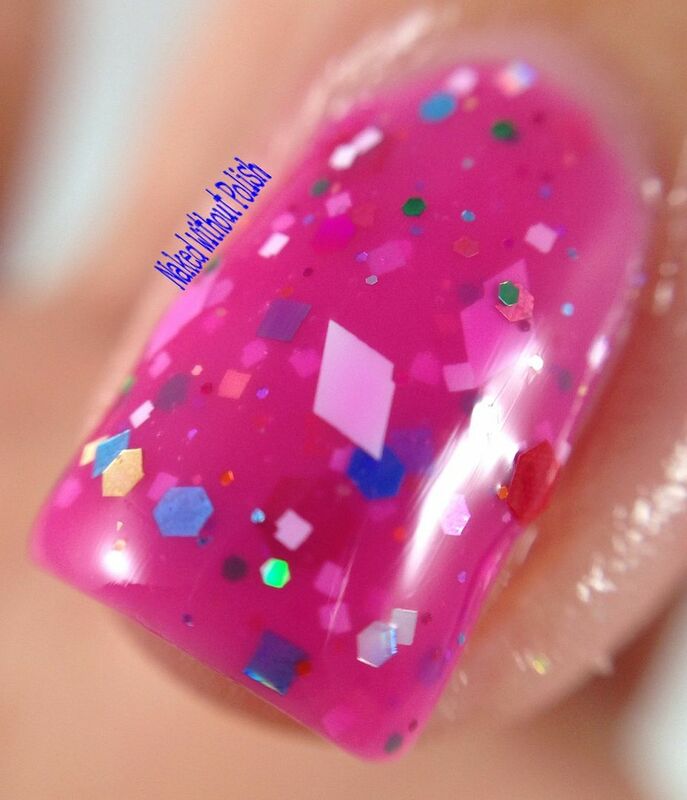 Bloody Bogey is described as "a bright pink crelly with white diamonds, red hexes, and various holo glitters". Shown is three coats of Bloody Bogey. 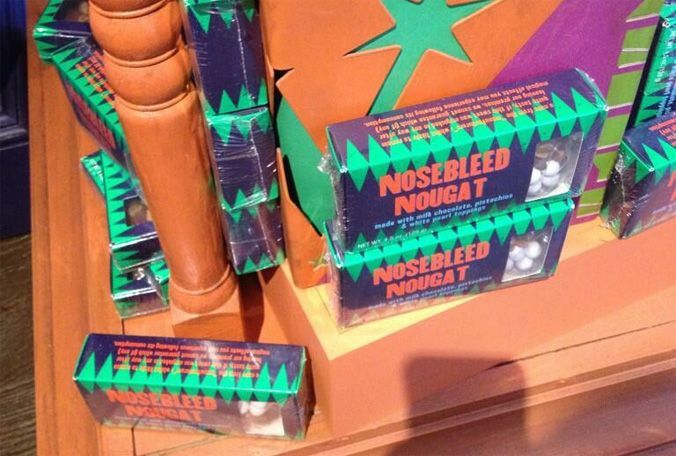 Bloody Bogey is inspired by Nosebleed Nougat. Nosebleed Nougat is "designed to make the eater's nose bleed heavily within seconds of eating it". 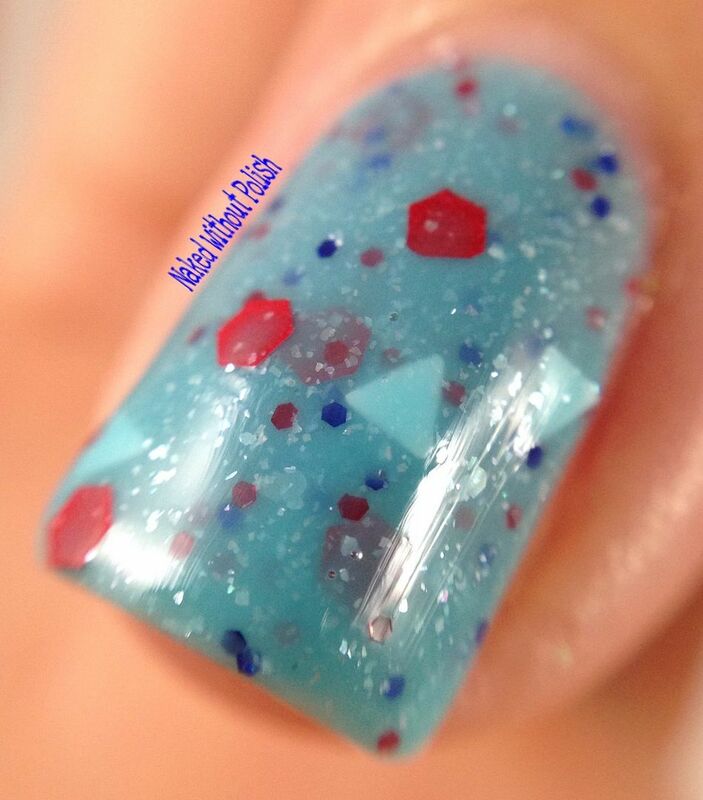 Sweet Induced Sweat is described as "a light blue crelly base loaded with red and blue glitters, navy holo glitter, white triangular glitter, and white flakes". Shown is three coats of Sweet Induced Sweat. Sweet Induced Sweat is inspired by Fever Fudge. Fever Fudge is "designed to make the one who eats it get a high fever within seconds of eating it". 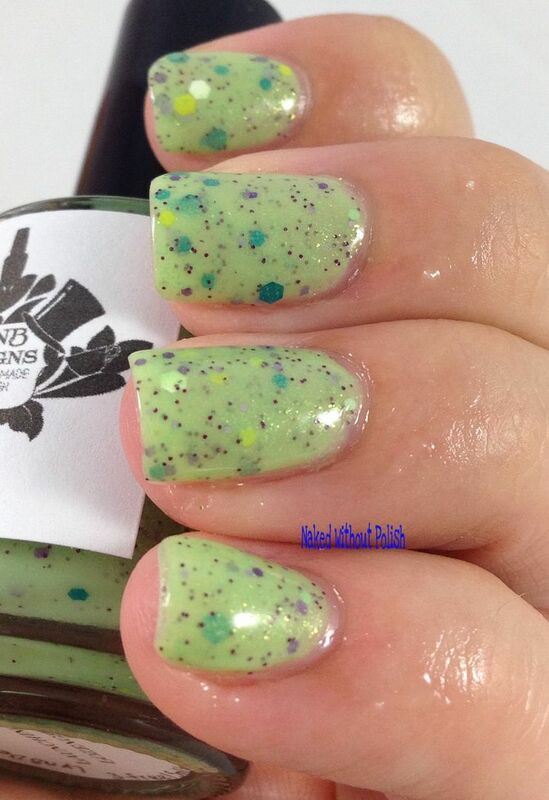 Launching Lozenge is described as "a spring green crelly base with gold flakes, purple micro glitter, teal, yellow, lavender, and white glitters". 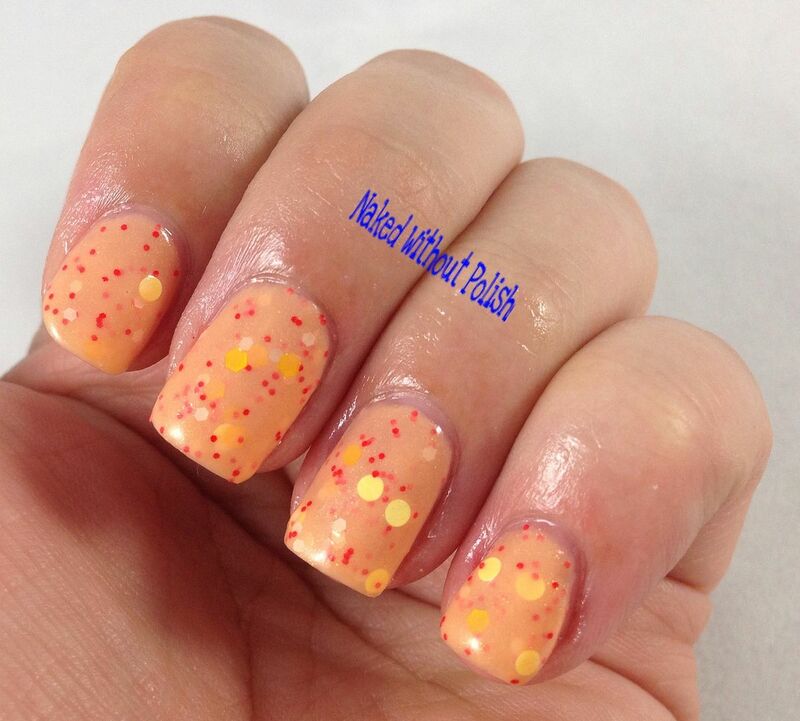 Shown is three coats of Launching Lozenge. 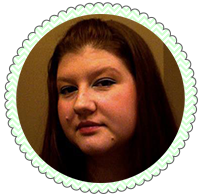 Launching Lozenge is inspired by Puking Pastille. Puking Pastille "makes the eater vomit within seconds of eating it". 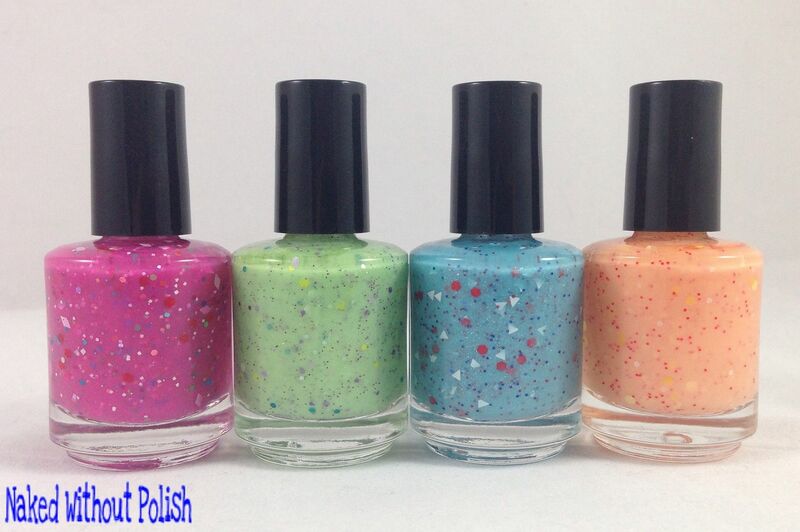 B-Smooth base coat and B-Shiny top coat were used on all of the swatches. 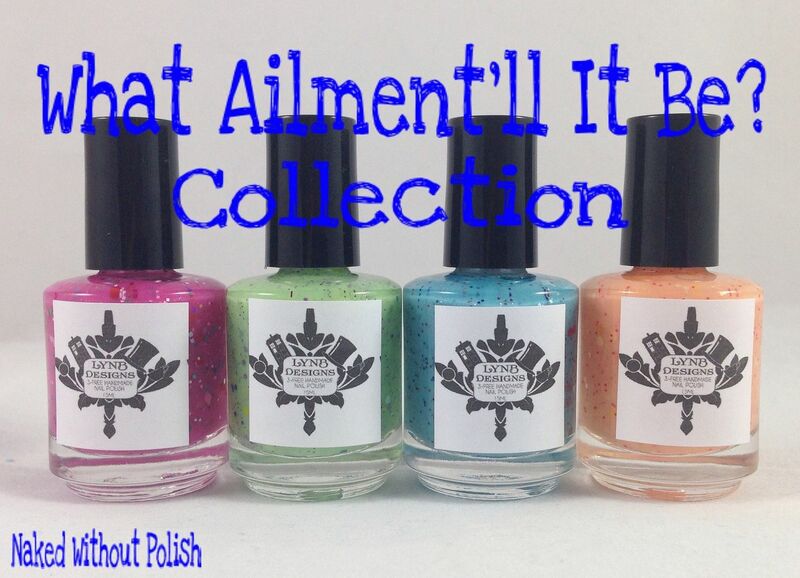 Every polish in the What Ailment'll It Be? Collection was absolutely wonderful. 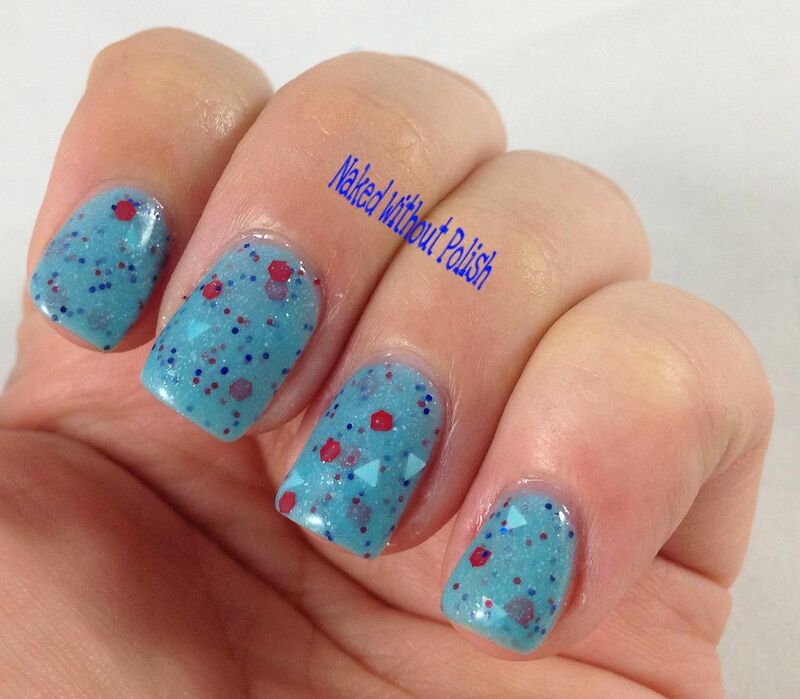 Each crelly's formula was spot on, and, despite the amount of glitter in these, they applied really well. No fishing for glitter for sure. 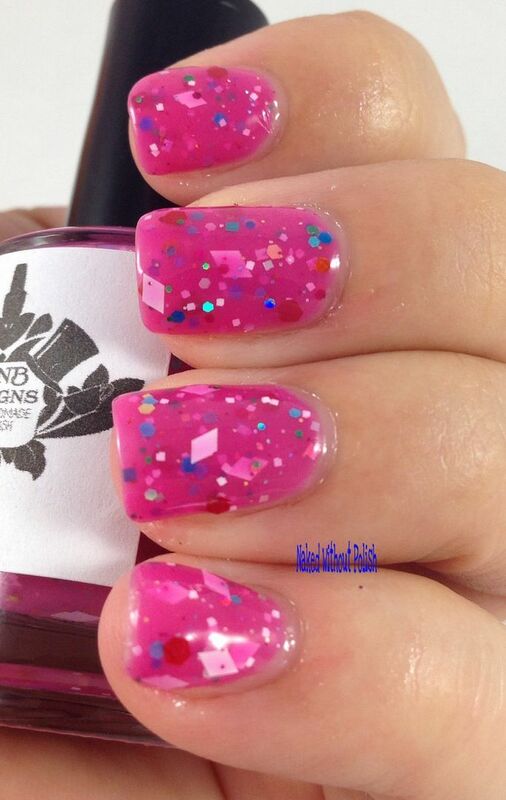 These are all loaded with glitter. They are all really quite wonderful. The What Ailment'll It Be? Collection will be released Friday, July 17, 2015 at 7 pm EST for $8 each. 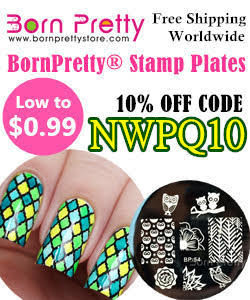 Along with the release of this collection, she will have a BUY 3 GET 1 FREE sale. 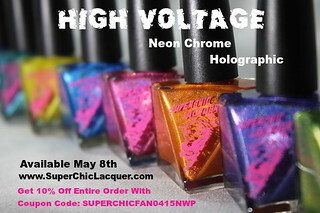 For every 3 polishes you put in your cart, add the one you want for free in the "Notes" section. AND...if you buy all 3 of the Harry Potter inspired collections, you can get free shipping with the code: HPSHIP. Both of these offers will last from Friday, July 17, 2015 at 7 pm EST through Monday July 20, 2015 at 11:59 pm PST. Oh...I'm sorry...did I say this was the last Harry Potter inspired collection? Nope, it's not! There will be more coming up!! Yes, that's right. LynBDesigns isn't done with Harry Potter. There are potions and people and places and so much more!! Is there anything Harry Potter related you'd like to see a collection inspired by? What did you think of this collection?